Automatic paper folding machines. Fold, crease and perforate. Morgana Systems has a full range of folders from the desktop range to the floor standing award winning range catering for all folding applications and specialising in Digital applications with the unique Digifold Pro. MORGANA DIGIFOLD PRO. Automatic Paper Creasing and folding machine. The Morgana DigiFold Pro automatically creases and folds digitally printed heavy weight stock at 6,000 A4 sheets per hour. In fact, it can crease and fold sheets up to 900mm long, creasing and folding in a single pass. Use as a stand-alone creaser when folding is not required or use as a perforator when creasing and folding are not required. The fast touch screen set-up allows the user to enter the required fold type and sheet length and then it automatically sets the creasing and folding positions ready to run the job. • Overcomes the problem of the ink / toner cracking by applying a crease that embosses the paper, embedding the ink / toner into the fibres of the stock. • The DigiFold Pro uses air to separate the sheets and feeds the sheets from the bottom of the stack to combat the issues encountered with static. • Direct mail - roll fold, tri-fold, z-fold and more. The Morgana Major has been designed to offer a wide range of ‘big machine’ features within a compact and easy to operate design. Changing from one size to another, or for different folds, can be accomplished in seconds. 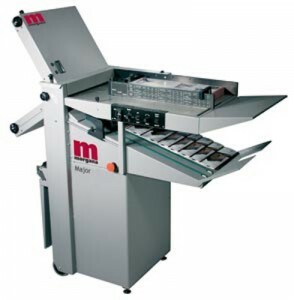 The Morgana Major incorporates counting and batching, with perforating and scoring as standard in the UK and optional elsewhere. The fold rollers are extremely durable and have the ability to handle a wide variety of stock without adjustment. Not affected by paper dust, their unique composite material will positively grip high gloss papers or work from digital print engines. The Dial-a-Fold plate settings enable all adjustments to be made without removing the covers. An LED display, accurate to 0.1mm, shows the fold plate position and allows easy and accurate repeat job settings. A larger sheet size of 365mm width and 674mm length makes the Morgana Major even more flexible, capable of producing 6pp A4 documents. The machine speed is fully adjustable from 4500 to 27,500 sheets per hour, giving the operator complete control over the production of a wide range of stocks. A high-speed automatic paper folding machine. An automatic folding machine designed specifically for the professional digital printer whose business is growing. 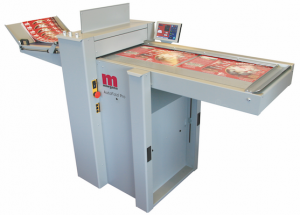 The AutoFold Pro is a free standing folding unit designed for folding digital stocks using our patented flying knife technology which was developed to prevent the scuffing and marking on digital stocks that are caused by folding using conventional methods. The AutoFold Pro is simply wheeled up to ANY creaser and the height of its vacuum feed conveyor is adjusted to the exit height of the creaser. The beauty of the AutoFold Pro is its simplicity allowing the user of ANY manufacturer’s creaser to invest in one and to improve their productivity and quality immediately. Although every effort has been made to ensure that the information on this website is accurate please refer to the manufacturer's website for the latest detailed information on this product before making your purchase. Prices are listed in Australian dollars and subject to change without notice.